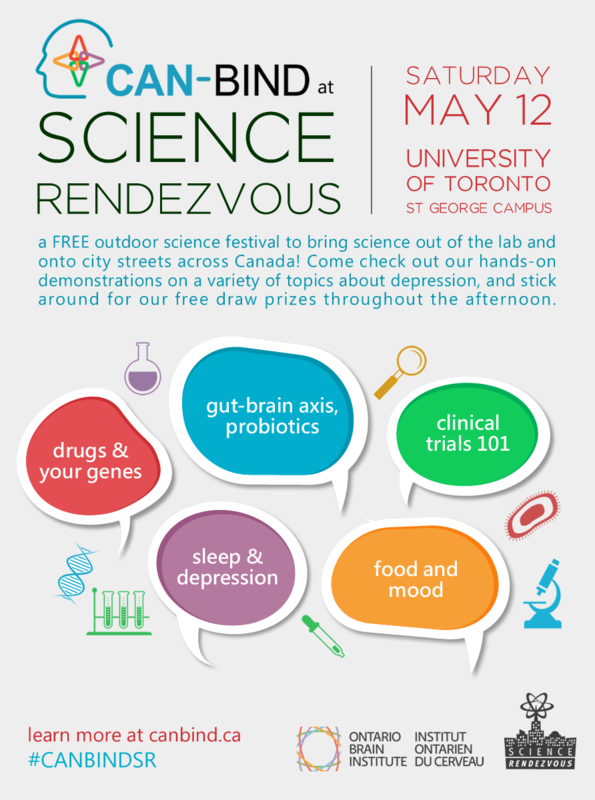 CAN-BIND participates in Science Rendezvous, a nationwide initiative developed to take “science out of the lab and onto the street”. 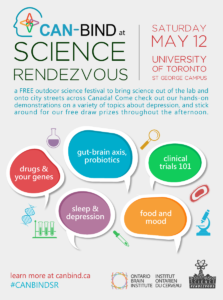 With over 300 events across 30 Canadian cities, this free festival features a wide range of demonstrations and hands-on activities to increase public engagement with science. Learn more at www.sciencerendezvous.ca. CAN-BIND’s Science Rendezvous exhibition booths are led by a team of CAN-BIND researchers and trainees. In 2018, the CAN-BIND team ran an exhibition booth to educate the public on sleep and depression, food and mood, the gut-brain axis, drugs and your genes, and the clinical research process. Stay tuned for a blog with photos! 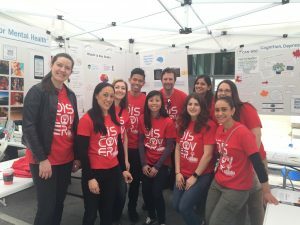 In 2017, the CAN-BIND team designed and ran an exhibition booth to share insights about mobile-health technologies for depression, how different brain structures are involved in mood, how music affects brain activity, the relationship between depression and cognition, and highlights from our zebrafish research. In 2016, CAN-BIND team members represented the CAN-BIND network at the Ontario Brain Institute’s (OBI’s) exhibition booth. Our autumn newsletter is now available. Catch up on our latest research and outreach updates! On the evening of October 11, 2018, the Mood Disorders Association of Ontario (MDAO) hosted a launch event for The CHOICE-D Patient and Family Guide to Depression Treatment. How is neuroimaging used in depression research? What does the CAN-BIND Neuroimaging team do? Looking for information about depression treatments? A free resource for patients and families is now available! The Canadian Biomarker Integration Network in Depression (CAN-BIND) is a national program of research and learning. CAN-BIND is discovering ways to identify the right treatment for the right person in order to help individuals with depression get well quickly, and stay well. © Copyright CAN-BIND 2019. All rights reserved.